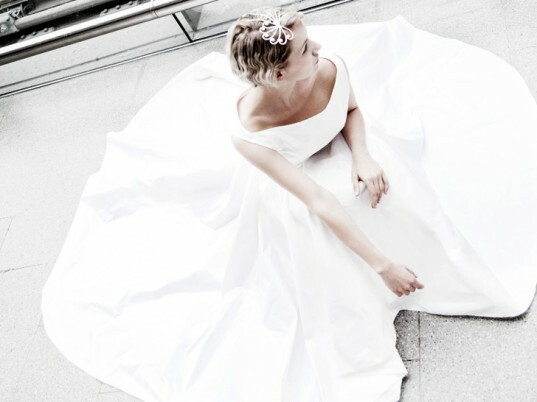 House of Tammam has launched the first, and so far only, ethical ready-to-wear bridal collection in the United Kingdom. Founded by Lucy Tammam, who also serves as the label’s creative director, House of Tammam is based in London’s Bloomsbury district, where novelists such as Virginia Woolf and Mary Shelley lived just around the corner. Whereas Woolf and Shelley were mavericks in literature, the same could be said for Tammam with respect to fashion design. A Central Saint Martins graduate, Tammam was classically trained in tailoring. Because of her passion for animal and human rights, she became a pioneer in ethical couture, voyaging to India as early as 2004 to locate suppliers who would meet her criteria for fair-trade and sustainable materials. When Tammam had trouble sourcing ethical fabrics, she put on her rucksack and headed to India. A year later, in 2006, Tammam and some friends established the Conscious Designers Collective, a group of independent young designers who were frustrated with the lack of an affordable platform for their work. These ventures fueled the inception of House of Tammam, which has been making ethically produced, sustainable wedding gowns for the past five years. Tammam continues to develop fabrics in India and Nepal using natural fibers and dyes. Tammam’s ready-to-wear bridal gowns are made from organic and fair-trade cotton, vintage lace, and peace silk. This season’s immaculately tailored gowns are inspired by 1930s glamour. The dresses match lovingly restored vintage lace with luxe peace silk to accentuate the female body. Peace silk, which is produced without killing the silkworm, came to prominence in the media when eco-fashion campaigner Livia Firth (wife of actor Colin) wore a peace-silk gown to the Golden Globe Awards in January. House of Tammam’s ready-to-wear range is available from selected online stockists, including Green Union starting at £350 ($573). 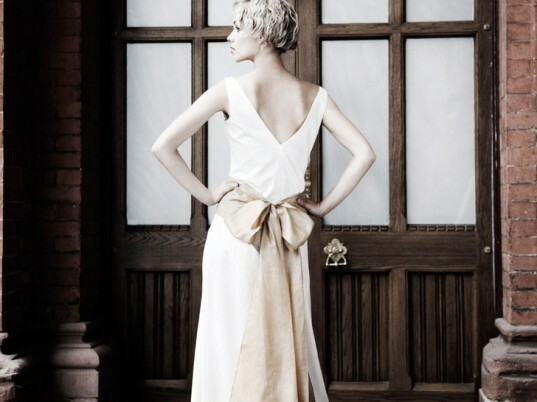 House of Tammam has launched the first, and so far only, ethical ready-to-wear bridal collection in the United Kingdom. Founded by Lucy Tammam, who also serves as the label's creative director, House of Tammam is based in London's Bloomsbury district, where novelists such as Virginia Woolf and Mary Shelley lived just around the corner. Whereas Woolf and Shelley were mavericks in literature, the same could be said for Tammam with respect to fashion design. A Central Saint Martins graduate, Tammam was classically trained in tailoring. Because of her passion for animal and human rights, she became a pioneer in ethical couture, voyaging to India as early as 2004 to locate suppliers who would meet her criteria for fair-trade and sustainable materials.